Two weeks ago at Dell Enterprise Forum in San Jose, we announced PowerEdge VRTX, a converged solution comprised of servers, storage, networking and management all in a single, office-optimized chassis the size of a desk-side tower. I’m pleased to say that the feedback from partners, customers, press and bloggers at the event was immediate and overwhelmingly positive. There have been a number of articles and blog posts written to date, and we were delighted to receive a 5 Star Innovation Award from ITPro. But we aren’t resting on those achievements. Over the course of developing and designing PowerEdge VRTX, we have had thousands of conversations with customers in the field and we know they need more than just powerful technology to help solve their problems. They need true solutions that address a deeper set of needs around applications, simpler systems management, resolving disparate infrastructure, and somehow bringing it all together in a way that makes it easier for them to use IT to support their business. At Dell, our focus is always on digging deeper into customer problems and requirements, and working to build solutions based on those conversations. 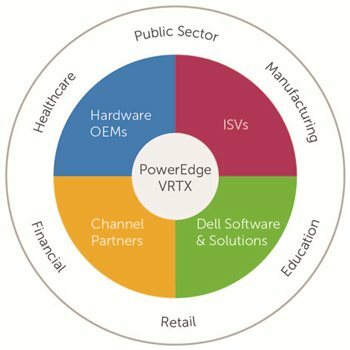 With that in mind, today we are announcing the PowerEdge VRTX Solutions Ecosystem, a collection of partners working jointly with Dell to further extend the value and capabilities of PowerEdge VRTX by testing and validating/certifying best-of-breed services and software designed for general and specific industry vertical markets and use cases. The VRTX Ecosystem is made up of Independent Software Vendors (ISVs), original equipment manufacturers (OEM), global alliances, channel partners, system integrators, as well as our broader portfolio of Dell Software and Services offerings. A flexible and efficient architecture designed for desktop virtualization hosting users running Microsoft Remote Desktop Services on Windows Server 2012. In July, Dell will release VRTX sizing guidelines for Dell DVS Enterprise for Windows Server 2012 reference architecture enabling customers in remote and small office environments to deploy desktop virtualization using Microsoft RDS with confidence. Healthcare and life sciences – VRTX has turned out to be a good feature fit for radiological imaging services, disaster recovery, and EHR/EMR. Retail – Retail companies require high availability and failover clusters on point of sale along with other usages including video surveillance, digital signage, supporting workgroups, and reporting to have the agility to address consumers and keeping their operations running smoothly. Education – Community colleges setting up networks for BYOD for students along with tablets and other computing devices for K-12 coming into the classroom; require flexibility to address the students and also provide services for collaboration amongst students and instructors. Manufacturing – engineering workgroups need powerful, but local computing resources to aid in design, modeling, and simulation. Logistics companies with multiple distribution points that can span continents require a flexible IT platform that provides consistency and can easily scale to keep pace with their complex business. Public sector – Military usage to disaster relief organizations to providing a workgroup server – there are multiple scenarios for VRTX to address these customers with its, form factor, operational requirements for cooling, power, etc. to support these environments and others in unique environments. Financial – Banking is by definition a branch-office business, and branches need stable, powerful, and compact solution to manage on-site transactions in the advent of WAN outages to keep the branch running. There is also the need to support multiple branch services including mortgages, lending, and other financial trading activities. The PowerEdge VRTX Solutions Ecosystem is just a first step in what we see as an evolving solution for our partners and customers to be able to take the fullest possible advantage of Dell enterprise offerings. As our own technology evolves, and as partners continue to bring fresh ideas to the marketplace, this ongoing collaboration will result in exciting new updates and milestones. I look forward to sharing those solutions with you as they develop.